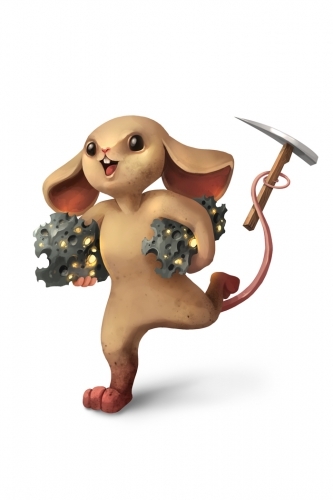 The Mischievous Meteorite Miner is a breed of mouse found in Fort Rox. They are known to drop Meteorite Pieces as loot. Seeing everyone else caught up in a craze to obtain the chunks of the meteorite, he quickly joined in! He has no idea what they are for, why people want them or what to do with them, but that doesn't stop him! He just grabs what he can and runs off with them to who knows where! Mischievous Meteorite Miner mice have no specific preference for any kind of cheese. Law type traps such as S.L.A.C. are very effective against the Mischievous Meteorite Miner mice. Mischievous Meteorite Miner mice can only be encountered during the daytime phase in Fort Rox. The Mischievous Meteorite Miner Mouse drops the Day Egg during the annual Spring Egg Hunt. This page was last edited on 27 May 2017, at 01:52.